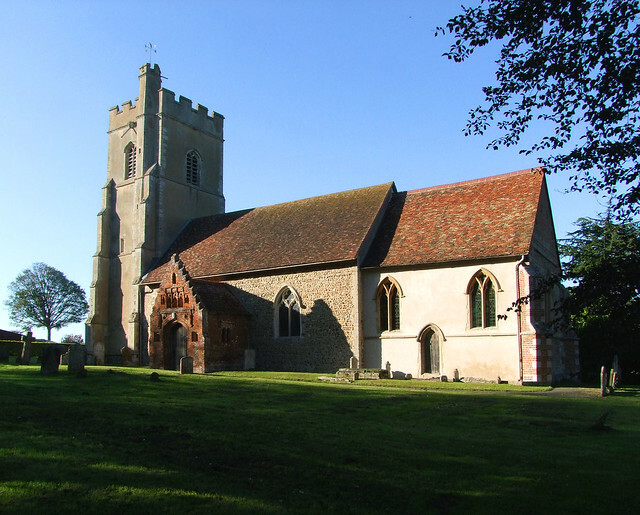 This is a lovely, little-known church, so far out on the edge of Suffolk that you could throw a churchwarden into Cambridgeshire from the graveyard. This would make him land in the Diocese of Ely, of course, which might send him scurrying back. In common with all the Haverhill area villages, this place looks to Cambridge more than it does Ipswich or Bury; but for all that, with a couple of minor exceptions, this is a typical Suffolk church, delightfully well-kept, with all the evidence of its long centuries, and open.This came as a happy surprise, as I had come here from a succession of nearby locked churches, but I remembered finding it open on my last visit, and it is clearly open every day. It just feels more full of life than its locked neighbours. What makes the building so appealing? Well, it is set in an expansive churchyard beside a farm away from the busy main road. The tower, like many at this end of the Stour valley, has one of those stair turrets that rises above the battlements. Secondly, it is a festival of arches of different periods that harmonise in a most pleasant way. The best ones are doorways. The north door faces the road, but is no longer in general use. it is almost certainly the original entrance to the Norman church. Two slender columns rise to a plain tympanum, squaring the door beneath with a lintel. The south doorway, protected by a fabulously pretty early 16th century brick porch, is even more splendid. This is later, probably mid-12th century, with jolly creatures for capitals, very unusual for Suffolk. I was conscious that I was almost no longer in Suffolk. The porch is interesting in that it has no less than eight image niches (or possibly six - I'm not entirely convinced by the two either side). Perhaps the central three were a rood group, the top one a madonna and child, and the two outer ones Peter and Paul. Or perhaps some entirely different arrangement. You step into a light, white interior. A whimsical mid-20th Century window by Powell & Son on the south side of the church depicts the adoration of the shepherds, and includes thatched cottages and what looks like a castle behind the Blessed Virgin and Christchild. There is other good 20th Century glass, although the war memorial window to Reginal Wilder is rather mawkish. Nineteenth century benches face through the narrow pointed chancel arch, which is the first development here out of the Norman period, and behind them the organ fills the tower arch in a pleasing manner. If you dare to peep behind it, you will see something most unusual. Set in the north side of the tower is a fireplace. It has a chimney, which comes out about five metres up on the outside. The church guide suggested that it might once have been used for baking the bread used at the Mass, although I can think of other reasons why you might have a fireplace beneath a tower, especially if it had been used as a vestry during the 17th and 18th centuries. However, it does appear to be part of the original fabric of the tower. Up in the sanctuary, there is another curiosity. Hard up against the east wall is part of an exquisite sedila, just one of the three seats that once were used by Priest, Deacon and Subdeacon in a High Mass. The thing that makes it so unusual is that the surviving sedile is the subdeacon's - that is to say, the most westerly. Clearly, at some point the chancel has been truncated, and the two upper seats and piscina have been lost. Although nothing at all survives of the roodscreen or rood, there is ample evidence here of how it was placed. In both south and north walls alcoves survive, and clearly outline where the stairs were, where the rood beam was, and how deep the rood loft must have been. It is a simple matter to recreate it in your head. Back outside, the late October afternoon was beginning to pale. I heard a mewing cry from far above me, and looking up saw a buzzard drifting with wide wings above the churchyard, a rare sight where I live in the east of the county, and another reminder to me of how far I had come.